A battling Jan Ullrich came in with Andreas Klöden 2:15 minutes behind and appeared to be suffering from more than just the effects of the climb. Ullrich: "I felt pains in my back while breathing. That was a little handicap. Big thanks to Klödi who waited for me. The Tour is still long." Alexander Vinokourov came in 5:18 minutes behind the leaders in a disappointing performance: "It wasn´t a good day for me. I found it difficult to find my rhythm." Basso said that he was content to have lost not too much time on the Texan. "I wasn't at my best but when I realised I couldn't go the same pace I just decided to drop back and go at my own. "Armstrong's performance doesn't surprise me as he is really strong." Vinokourov all but admitted that there was no stopping Armstrong. "He can take you out anytime he wants," said the downcast Kazakh. "I went very badly the whole day; I believe that it has been a horrible stage for the whole team and also for me, especially in the last climb. I was expecting more, but I admit that I have gone too long without taking part in an important race and [today] I felt it. There is still a lot of radcleft and I expect to be able to do better than today." "did not feel good from the beginning of the day and at the end I was very bad. ... I do not [know] what has happened to me, because till now I felt very good. Because of that I hope that I was just having a bad day, because I felt very good [before]. Simply, my legs were not working today. I am now very far down in the general classification, but still hope to see if I can recover the form that I had before. I have suffered a very hard blow, but I will try to recover and tomorrow we will see if it was only a bad day." More links welcome in the comments, if you've seen other rider reactions. Sammarye “Velogal” Lewis has started posting some galleries at smugmug.com: You can order (very reasonably priced) prints of any of her shots, mostly off-the-bike shots. Today, she caught Robbie McEwen, apparently still arguing over his relegation yesterday in Stage 3. Lewis is a co-author of Tour de France for Dummies . "He was the only one to stay with Lance in the mountains [in 2004]," Bruyneel said. "Will he be able to maintain his condition for three weeks on the Tour? That's the question mark. But it's possible." 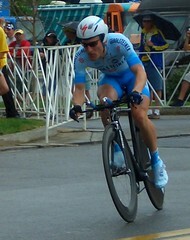 "Vinokourov takes advantage of every opportunity," said Bruyneel. "I think he's become more resistant over the years, and stronger in the mountains." Bruyneel downplayed Liberty Seguros' Roberto Heras and Joseba Beloki as GC threats. Two Americans, with Christian Vande Velde home recuperating and looking toward the Vuelta in September. Cycling4All.com probably maintains the most complete provisional Tour start list. Eurosport is the only one of the usual bunch doing live updates. Below is, well, commentary on their commentary. The strong men are reeling in an early break that stayed away well onto Mont Ventoux, the legendary climb that finishes today's stage. In the chase, a few familiar names, including former US Postal lieutenant Roberto Heras and 2004 Tour de France runner-up Andreas Klöden, have fallen off the select group. Jorg Jaksche of Liberty Seguros and Davitamon-Lotto's Wim Van Huffel are the two surviving breakaway riders, but the leaders, including Levi Leipheimer and David Moncoutie, are closing fast. Lance Armstrong has been dropped and recovered the select group -- he looks to be having difficulty holding Leipheimer's pace. Floyd Landis is still in the leader's group, as well. With about 5kms to ride, Saunier-Duval's José Gomez-Marchante attacks from the select group, taking T-Mobile's Alexandre Vinokourov and overall leader Levi Leipheimer with him. No word on Jaksche, but Van Huffel is getting rolled up by these three. Armstrong, Landis, Moncoutie, Kashechkin (bless you), are falling off the lead. Now Vinokourov and Gomez-Marchante have dropped Leipheimer. They've caught Van Huffel to take the stage lead, and Leipheimer is falling back into the Armstrong group, maybe 30 seconds back. With 2 kms to go, it's going to be Vinokourov or Gomez-Marchante for the stage win (and I'm betting on the Kazakh...). With 1 km to go, Armstrong, Leipheimer, Landis, and Kaschechkin have pulled back some time, trailing by 17 seconds. With about .5 k, it's go go Vino, and Vinokourov is riding away from his break companion Gomez-Marchante. Vinokourov takes the stage! It's all down to the time gaps now. At the finish, Leipheimer holds his leader's jersey! Colombian Felix Cardenas stomped to a bold mountain-summit win in Stage 17 of the Vuelta a Espana Wednesday, as Liberty Seguros rider Roberto Heras, third on the stage, pulled further into the overall lead. Alejandro Valverde (Kelme) cracked off the back, finishing the stage 3 min 11 sec adrift." Heras leads Phonak's Santiago Perez by 1:13, while Valverde fell from 2nd to 3rd, now just 1 second ahead of Illes Balears rider Francisco Mancebo, who was 4th on the day. The stage win by Cardenas suggests he'll take the Vuelta's overall climbing jersey into the Madrid finish on Sunday. Readabet.com notes that Lance Armstrong gets no love from the European bookies this year. He's been a heavy favorite the last two years, at 1-to-4 last year and 1-to-2 in 2002. This year, Armstrong is 11-to-10 at one bookie, and 1.26-to-1 at another. His best odds are 90-to-100 at SportingOdds. Perhaps the best-known European bookmaker, William Hill, has Armstrong at 1-to-1, Ullrich 2-to-1, Hamilton and Mayo 6-to-1, Heras 20-1, Ivan Basso 25-to-1, Haimar Zubeldia 28-to-1, Francisco Mancebo and Carlos Sastre at 40-to-1, and USPS rider Jose Azevedo and Igor Gonzalez de Galdeano at 50-to-1. There's a wide disparity among certain riders: Hamilton, for instance, is anywhere between 4-to-1 and 8.4-to-1, and Mancebo anywhere from 40-to-1 to 309-to-1. Roberto Heras looks to me like the dark horse Tour contender. His Liberty Seguros team has concentrated on events around Spain, skipping the Dauphiné and Tour de Suisse in favor of the Euskal Bizikleta and Volta Catalunya. Heras won the Euskal this year, and just before that race, sat down for an interview with Cyclingnews.com. He discusses perennial runner-up Manolo Saiz, his new team director; a few changes Saiz has made to improve Heras' riding; and Heras predicts that Armstrong, Ullrich, Mayo, and Gilberto Simoni are men to watch, and "I am also amongst those that weigh into the mix, within the group that comes after Lance. After Lance, well, there comes the rest of us." CN: The Tour route this year is a little different isn't it? There are less mountains in one way, but there are also less flat stages, and then there is the time trial up L'Alpe d'Huez and the changes in rules to the team time trial whereby a team can only lose up to two minutes and thirty seconds. What effect do you think this will have? RH: I think that the differences between the contenders will be much less than it has been in recent years: We should see a Tour that is much more open. Roberto Heras left US Postal after the 2003 season to lead the Liberty Seguros team and seek victory in the big tours. With less than a month to the 2004 Tour de France, he's taken the biggest victory of his season, at Euskal Bizikleta (aka Bicicleta Basca). Roberto Laiseka took the day's stage, giving the Euskaltel-Euskadi team a big win in front of the home crowd, and vaulting Laiseka into 2nd on the General Classification. American Levi Leipheimer of Rabobank got his first win in more than two years today in the Setmana Catalana, winning the mountaintop finish atop Port de Comte. Leipheimer and Joaquin Rodriguez of Saunier Duval caught Roberto Heras of Liberty Seguros just 150 meters from the finish. Leipheimer took the stage win, but the higher-placed Rodriguez took over the race lead with only Friday's stage left to race. There are at least 10 riders within 4 seconds of the lead. Leipheimer is 14th, 37 seconds back. Heras, the former US Postal rider, sits 38th, 18:36 back, and Jan Ullrich, riding into shape, is 90th, 55:54 back. "As we see him going now, and looking at his rivals, I see him with the capacity to win a sixth Tour," Indurain said. "I see him with the same motivation as other years and his results so far this year indicate he took care of himself over the winter." "Physically, he looked good even though the last Tour there were a lot of problems," Indurain said. "It's obvious that the passing years don't count in your favor, because you lose your explosiveness and this has always been his strength. But you gain experience at the same time and that's important, too. Every year it's harder to find the form and it takes longer to recover during the races. It's essential to arrive in good form at the start." "My time has come," Heras told the Spanish daily AS. "I'm giving everything for the Tour." "The Tour was already my goal for the 2005 season and by joining Liberty, I have moved it up by one year," said the two-time Vuelta a España champion. "I see Armstrong has begun his season on a good rhythm and he looks good. Ullrich is not as strong, but we all know from other seasons that it's not until May or June that we begin to see his true level." Heras said he's been riding 600 miles per week and working out 5-6 hours weekly on his upper body.